PEI's Two Hours Traffic has become one of the premiere bands in the region, and across the country, in the decade they've been together. Ya, ten years now since they formed at university, all around 19 years old, and then handed a self-produced debut E.P. to Joel Plaskett at one of his Island shows. Plaskett loved them, and joined up to produce their first three albums, discs that have won ECMA's, been on the short list for the Polaris music prize, and seen them become fan and touring favourites across the country. The new, fourth album is just out and it marks a major change for the band, a few of them actually. It's called Foolish Blood, and sees them part ways with a couple of key players in their history. First, guitarist Alec O'Hanley has left, prompting a shift for the other members. Bass player Andrew MacDonald has now moved to guitar, and they've added new bass player Nathan Gill. And Plaskett's no longer behind the board. This disc sees them working with well-known producer Darryl Neudorf, who has credits a mile long, including The New Pornographers and The Sadies. And the changes keep coming once you throw on the disc. 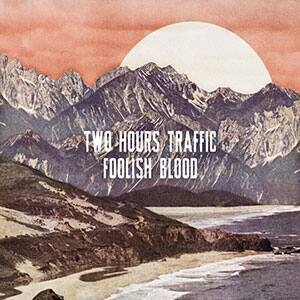 Two Hours Traffic has always been a pop-rock band, with an ear to classic sounds. Yet they've had a modern approach as well, and fit in with the alternative crowd just fine. This time out, Foolish Blood ups the ante on both ends, and the result is the most concise disc of their career, eleven crisp songs that are drenched with jangly power pop, bell-ringing guitar solos, and a more 60's sound than they've had before. The power in the pop comes from a big drum sound, really solid and loud in the mix. Melodic bass thickens out the bottom end. Then the sweet part gets dripped on top, with those chiming guitar lines, and singer Liam Corcoran's happy vocals. Cororcan has a voice made for pop, always cheery, always able to deliver those classic love lines. Yes, it's the boy meets girl, boy woos girl via the 3 minute hit record, that staple of 1960's music. As he tells the title character in the song Audrey, "every song that I sing, you stand up front modeling, locking arms with him, and eyes with me." Another song shows Corcoran's great way with the couplets and double-meanings. He has some fun with french in Amour Than Amis, with the chorus "we are more than just amis/but lovers we are not". Just in case you think this all sounds too bubblegum, don't forget that thundering bass and drums underneath, making this all tough rock, too. The cut I Don't Want 2 Want U takes the old rockabilly riffs of some really early rock, adds some hand claps, and turns it all into a garage-rock gem that's equal parts 50's, 60's and today. And what's a new album without a new tour? Catch Two Hours Traffic on the road this month, this Saturday the 23rd in fact, at the Tide and Boar in Moncton, and then the following Thursday, the 28th, at the Capitol Complex in Fredericton.